While society has come a long way in supporting women in the workplace, some industries are still lagging behind, and women in these fields face a variety of challenges. Between pervasive stereotypes, perceived work/life demands and a lack of opportunity, women face an uphill battle to advance their careers in sectors like finance, sports, science, technology, engineering and mathematics (STEM), just to name a few. Breakfast of Champions in support of SickKids, an annual roundtable networking event for young professionals, gathered insights from some of its “champions” who have become leaders in these male-dominated industries, and they offered top career advice for women to succeed in the business community. By offering up their career play books, mentors help other women develop traits, habits, skills and best practices to become more effective leaders in the workplace, spurring their careers forward. But there is still more that can be done. Doubt can creep in at any time, under any circumstance – not just in regards to professional abilities. “There could be many reasons why you’re not where you hope to be but if one is that you’re waiting until the temperature’s perfect before you put your toe in the water, you’re going to wait a long time. Some women put their career goals on hold to raise a family or they hesitate to seek promotions for which they’re qualified because they fear they won’t be able to manage on both fronts. But the two aren’t mutually exclusive. If you wait for the stars to align before you get going, you’re engaging in a form of self-sabotage because you’re limiting yourself,” said Lisson. The old adage “fortune favours the bold”, doesn’t just belong on an inspirational mug, it’s a mantra that many successful business leaders follow. While strategy and calculations are important parts of any business, women need to take risks too. Although successful women in the business community may attribute their success to many different factors, leveraging a supportive network and stepping up to take ownership of your career have emerged as a common thread. Believing in your abilities and drawing inspiration from other strong female leaders is just the start to paving the path to success. Lisa Lisson, Michele Romanow and Mary Ann Turcke all participated as champions at the 7th annual Breakfast of Champions in support of SickKids in Toronto. 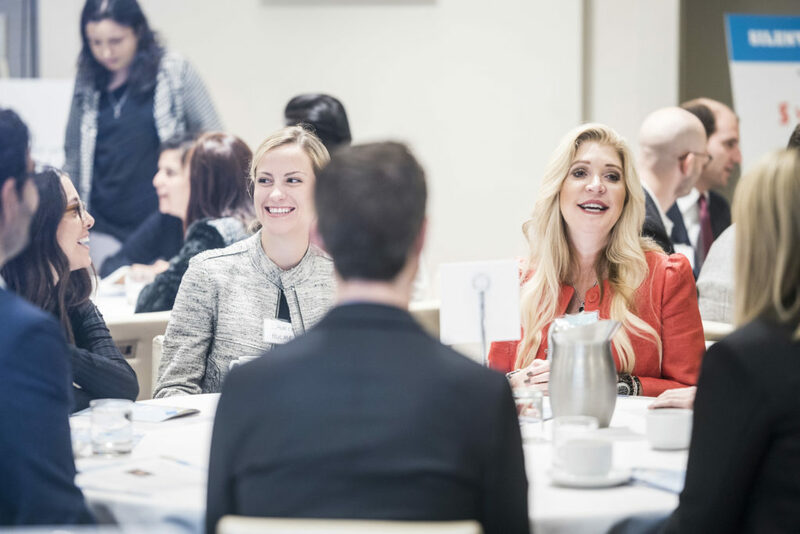 Alongside approximately 30 other top-tier Canadian business leaders, they offered young professionals their candid career advice at the round-table charity networking event. Since its inception in 2012, Breakfast of Champions has raised over $750,000 for various under funded areas at SickKids. Proceeds from this year’s event will be donated to the Division of Cardiology at SickKids. To learn more, please visit http://www.breakfastofchamps.ca.